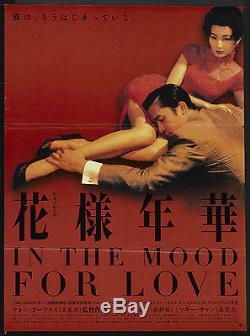 In the Mood for Love (Mei Ah Entertainment, 2000). Japanese B2 (20.25" X 28.5"). Starring Tony Leung, Maggie Cheung, Ping Lam Su, Tung Cho'Joe' Cheung, Rebecca Pan, and Lai Chen. An unrestored poster with bright color and a clean overall appearance. It may have general signs of use, such as slight fold separation and fold wear, pinholes, or very minor tears. Please see full-color, enlargeable image for more details. The item "In the Mood for Love 2000 Original Japan J B2 Movie Poster" is in sale since Saturday, June 27, 2015. This item is in the category "Entertainment Memorabilia\Movie Memorabilia\Posters\Originals-International\2000-Now". The seller is "oed248" and is located in Artins. This item can be shipped worldwide.